Go Africa Network, Inc. has teamed up with Google for this year’s 4th Annual African Union Expo 2018! Small businesses are the growth engine of our economy, creating 2 out of 3 net new jobs. And businesses that are online grow 40% faster than those that aren’t. Go Africa Network and Google believes we can help small businesses connect with more customers by helping them get online and on the map. 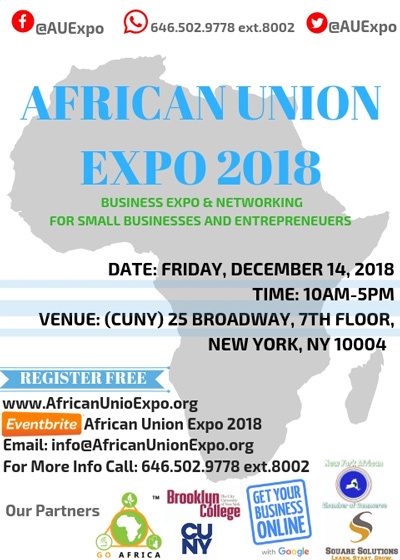 The African Union Expo 2018 seeks to reinforce economic opportunities, promote trade, investments, and equip entrepreneurs and small businesses within the communities of African, Caribbean, Latino, and other minorities across the greater New York area (and nationally) to foster connections and ease business opportunities in the domestic USA and across Africa. Our 1-day Expo is FREE to the public and will feature guest speakers and presenters leading informative breakout sessions throughout the day. Additionally, the Expo will include Resource Exhibitors providing information on health care, social services, financial services, and small business technical service providers. All inquiries can be directed to isouare@goafricanetwork.org or call: 646.502.9778 ext. 8002.